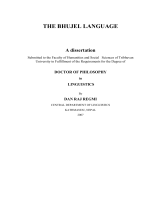 related to the conditions of the distribution of the locative and diminutive morphemes are examined. the standardized orthography for the three dialects (Sous-Commission Nationale du Dagara 2002). why I am striving to write it in English, for the easy access of the widest target audience possible. tradition is generally a long process, marked by a number of stages of progress and improvement. 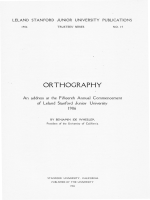 the emergence of the scientifically based and standardized orthography. circumflex), not to indicate tones, but to indicate the timbre quality of vowels (e.g. open/closed). linguistic training in France during their studies as priests (especially in phonetics and phonology). orthography, making it a more efficient tool. But the duration and scope of the forum were limited. reputation, they were both invited to the meeting as the keynote speakers and resource persons. as well as on the reports of the meetings of 1972 and 1973.
only appears at the surface level, being the result or signal of a morpho-tonemic transformation. distinctive tones, i.e. those playing a core role in the meaning of the written messages, are indicated. This will be further illustrated in section 5.
the meaning вЂ�lightвЂ™. Thus, cГЈ is easier and more economical to write and learn than the older forms. 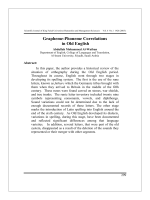 equation is simple - one phoneme = one grapheme. short, i.e. they can be a single vowel or a consonant. will be described in later sections. mark every tone. It would be neither necessary nor aesthetic to do so. all able to produce them correctly, automatically and almost unconsciously. various sorts of constraints call for a selection, a limitation of their number of occurrence in the text. tone-marking of Dagara. They pertain to the first category of tones. economical and simple. In this Dagara orthography, the latter way has been adopted. the grave accent Г , which marks the low tone. The mid tone is never marked. the discourse. The percentage of their use in any kind of speech and about any topic is high. 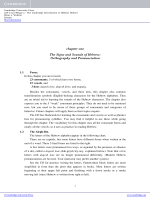 is why tones differ so much on subject personal pronouns in Dagara. they have mid basic tones. That is why they are not marked. tones of both words must always be marked in the orthography, except the mid tones. Abbreviations: H = High tone; L = Low tone; M = Mid tone (never marked). form or a structure which is optional. This is not the case here. not deliberate. This is partly due to the fact that this list is not complete. It has been given randomly. theoretically valid as long as there is no example which contradicts it. or falling (high-low), only the first half tone is marked. The second half tone is left unmarked. acute accent is used. If it is low, then the grave accent is used. This exception below is due to the effect of the locative marker. (HL or LH), it is mandatory to mark both tones. vowels, there are also nine long vowels in Dagara. under certain specific conditions (see section 7 on diminutives below). The closed front vowels are: i, Пґ. The front vowel diphthongs which are attested are: ie, ПґПЇ, Пґa, aПґ. The combinations which are not attested are: *iПЇ, *Пґe, *ia5. The closed back vowels are: u, Р„. The back vowel diphthongs which are attested are: uo, Р„Сђ. The combinations which are not attested are: *uСђ, *Р„o, *ou (ow), *СђР„ (Сђw). The asterisk sign indicates that the form it precedes is not attested or concretely realized in the language by speakers. *Р„a, *ua, *au (aw), *ui, *Р„Пґ, *Р„ПЇ. The general rule for vowel harmony is that it operates progressively (forward, i.e. from left to right). the rest of the vowels which follow must also be [+ATR], throughout, from left to right. tГЎ...i). It is good to keep in mind that only the variants Пґ or ПЇ are represented in the orthography. variant forms are the same both in the indicative and the imperative moods. accent is put above the tilde. nasalization is doubtful and may not be genuine. The tilde is not required. genuine. They must have the tilde. orthography. It is only to be noted as a phonetic phenomenal characteristic of some idiolects. form is a single entity, it is recommended to write them as one word without any space in between. formed. This is one of the rare contexts in which vowel harmony applies across word boundaries. morpho-phonological transformations of the nominal root which precedes le. those of the word its follow and modifies. These words take a dash. It is to be observed that they all have a common lexical semantic feature. They are diminutive terms indicating family relationships (see Section 9.1.2). To express the sense of place, site, location, or spot, the Dagara language uses a variety of particles. the most frequent variants are: - , -Г­, -m , -mГ­, -r , -rГ­, б № (including the tilde as vowel nasalization). with it without any dash or space. locative morpheme and function of the word. low tone). In this regard, it is an exception. It is important to note that the word zГєu вЂ�headвЂ™ is sometimes spelled with only a short vowel like zГє. The two forms are correct. They are local lexical variants. long text, there may be numerous вЂ�holesвЂ™ (big spaces between words) in the lines of the text. 8.1 Where and When not to Break? modal suffix is not always clear. and thus is an obstacle to comprehension and reading. consonant in the initial position at the beginning of a line in a text. This is why it should be avoided. as possible to make reading easier for new readers. the Dagara orthography as digraphs pertaining to the alphabet and considered as single sign units. vowel, a consequence of the rapid speed of the elocution of some speakers in the oral discourse. 8.2 Where and When to Break? text to avoid holes because there is no other solution, the following instructions should be followed. orthographic rules. These rules are explained below. inserted in the space between the two words. represented as one word in writing. Others are written with a dash. These are a few exceptions. feature [В± closed] is sometimes used as a valid and pertinent feature in the vowel system of French. combined to form the name. These names can be full sentences. consonant loss). In this case, the two or three components are separated from one another by a dash. morphemes which mark aspect and modality. instrument is played (a hitter). value on its own. This reason requires the writing of these words as a single unit without any dash. below in boldface) often generate new concepts, unexpected images, and poetic styles. monkey-male-father Neg1 Aux know what-to-do? ЦЉm a-dГ -s a (It means literally: вЂ�a monkey-male-fatherвЂ™). or persons in charge of the welfare of a group (especially among humans). a close relationship between vowel elision and the type of language. personally not to write forms in which vowel elisions are manifested. Writing in full forms, i.e. according to the rules of вЂ�literary languageвЂ™ (without vowel elisions and regressive assimilations). is left out in the table below is the three points of suspension (...). Its use is yet to be tested. End of sentence. Long stop. Without space. Long stop. Enumeration. Introduce direct discourse. space. Separates chapters in references (Bible). sentence. Interrogative form. Without space. Quotation. Direct discourse markers. Long stop. Space outside and no space inside. 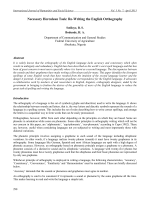 paper will contribute to the further development of the Dagara orthography. Delplanque, A. 1983. 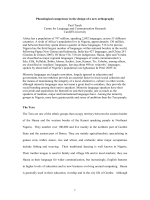 Phonologie transformationnelle du dagara: Langue voltaГЇque du Burkina Faso. PrГ©face de Luc Bouquiaux. Paris: SELAF. Nida, E. A. 1967. Comment Traduire la Bible. New York, NY. : Alliance Biblique Universelle. Ronde organisГ©e sur lвЂ™orthographe moderne dagara. DiГ©bougou, Burkina Faso: ABBF. Linguistique Africaine. Nice:UniversitГ© de Nice, France. Rapport Final. Ouagadougou: ONEPAFS, 49-61. Haute Volta. In Rapport Final. Ouagadougou: ONEPAFS, 55-68. SomГ©, J. D. 1983. Description de la langue dagara de Haute Volta (Groupe VoltaГЇque): Vols. 1 & 2. ThГЁse de Doctorat. UnversitГ© de Paris V (RenГ© Descartes), Sorbonne. de LittГ©rature EvangГ©lique) et ABCI. (Centre de LittГ©rature EvangГ©lique) et ABCI. November 1, 2003. Accra, Ghana. SomГ©, J. D. (ed). 2003. Actes de la Table Ronde organisГ©e sur lвЂ™orthographe moderne du dagara. Sous-Commission de traduction. 1972. Rapport de la premiГЁre session sur lвЂ™orthographe dagara. Maria-Tang, Haute Volta: DiocГЁse de DiГ©bougou. Sous-Commission de traduction. 1973. Rapport de la deuxiГЁme session sur lвЂ™orthographe dagara. Dissin, Haute Volta: DiocГЁse de DiГ©bougou. Sous-Commission Nationale du Dagara. 2002. Lexique de la langue dagara du Burkina Faso. Ouagadougou: Sous-Commission Nationale du Dagara. Vicariat Apostolique de Bobo-Dioulasso. 1961. Dagara Naamwin sor kano per iru sebe. MaisonCarrГ©e, AlgГ©rie: Imprimerie des PГЁres Blancs.